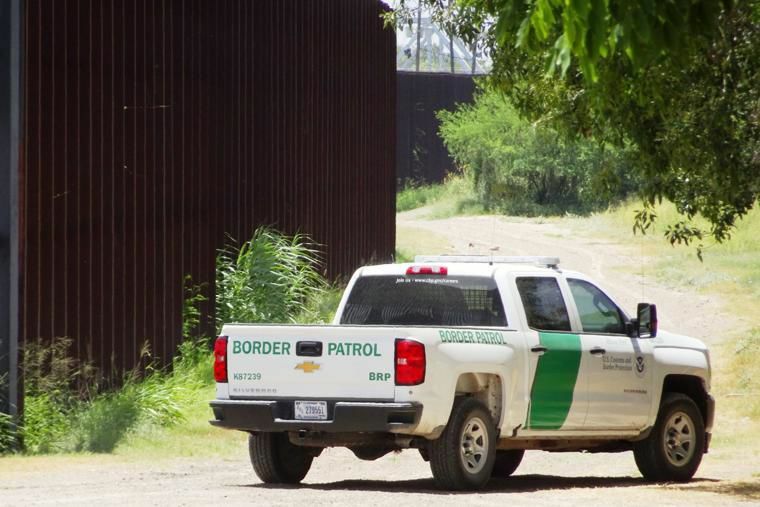 In this file photo, a U.S. Border Patrol unit patrols along the U.S. border fence in Brownsville. The lush landscape of the subtropical Rio Grande Valley and Cameron County stands out for so many reasons. There’s the rich farmland and agricultural lifestyle in rural areas where white cotton fields stand in contrast to the rugged palm-filled wildlife habitats that still exist while cities like Brownsville thrive culturally and serve as major points of international trade. Then there’s the gift of wildlife that draws tourists from all over the world who flock to the Rio Grande Valley in hopes of seeing a rare bird, like a green jay or an Altamira oriole, and being able to check a box off their birding life list. There’s also endangered species that only exist here, with animals like ocelots and jaguarundi that draw nature enthusiasts to the Valley’s natural preserves. But there’s another site that sets the border region’s landscape apart from the rest of the country: miles of reddish-colored steel fencing that stand 18-feet tall, looming over farmland and tree lines while dwarfing country houses far from the sounds of Brownsville and its three international bridges. Last week, the Department of Homeland Security announced that it plans to fill in 11 gaps in the existing border fencing built in Cameron County more than a decade ago. Those remaining gaps exist in rural Cameron County, a region of agriculture and eco-tourism. And the planned work is centered near a wildlife preserve and the Lower Rio Grande Valley Wildlife Refuge. On a recent afternoon, a tractor rolled down Southmost Bouelvard and pickup trucks could be seen entering and leaving gates and gaps in the border fence. Border Patrol units could be seen through the fencing patrolling the levee. A Brownsville Irrigation District pickup drove down a dusty caliche road and went south of the fence through a gap. This gap, and others, including one that leads into the 1,014-acre Lennox Foundation Southmost Preserve, are the focus of DHS’ border fencing plans in Cameron County. Vanessa Martin, interim director of marketing and communications for the Nature Conservancy, which operates the Southmost Preserve, said federal officials recently notified the preserve that border fencing will impact it. “To our knowledge, DHS has not finalized the access plan but we’ve made a request to keep the gate open during business hours so that active restoration, research, farm operations and the native plant nursery, which serves as the seed and plant source for restoration projects in the region, can continue,” said Martin. Federal officials have yet to notify the Southmost Preserve on the status of that request. The additional construction will further seal off access to the preserve. Martin said after the federal government condemned a portion of the preserve in 2009 to build the fence, it left 85 percent of the preserve’s wetlands, grasslands and forests behind it. The preserve, which quietly continues to operate despite the fencing, describes itself as the jewel of the Rio Grande Valley. “This area represents a unique transition between temperate and tropical climates and includes an exceptionally high diversity of plants and animals, some found nowhere else in the United States,” Martin said via email. The Nature Conservancy has been in the Rio Grande Valley for more than three decades. “Southmost Preserve’s wetlands, grasslands and forests also provide important habitat for a number of rare, threatened and endangered species, including the Texas tortoise and the southern yellow bat,” Martin wrote. The fencing constructed a decade ago placed strains on an already sensitive environment, and the filling of the gaps will impact a key wildlife corridor located in the Southmost Preserve. DHS Secretary Kirstjen Nielsen last week published a document in the federal register asserting her agency’s right to waive more than two dozen laws, many of which protect the environment, in order to expeditiously construct border infrastructure, namely gates and roads, in Cameron County. “The United States Border Patrol’s Rio Grande Valley Sector is an area of high illegal entry. For the last several years, the Rio Grande Valley Sector has seen more apprehensions of illegal aliens than any other sector of the United States Border Patrol (“Border Patrol”),” the document states. A sampling of the laws DHS is waiving include the Endangered Species Act, the Clean Water Act, the Safe Drinking Water Act, the Solid Waste Disposal Act, the Farmland Protection Policy Act and the National Wildlife Refuge Act. Scott Nicol, co-chair of the Sierra Club’s Borderlands Campaign, said the waiver demonstrates that the federal government’s border fence violates the law. To Nicol this is offensive. The waiver, to Nicol, states that the border fence is more important than the ecosystem in the Rio Grande Valley, which is a big money-maker here as the area’s wildlife refuges and coastline draw eco-tourists from around the world. One popular birding destination, Sabal Palm Sanctuary, even has a sign reminding visitors who turn onto the dusty road that passes through a gap in the border fence that they don’t need a passport to visit. As of last week, a staffer at Sabal Palm said the park hadn’t been contacted by DHS about plans to build a gate in that gap and Nicol said he hadn’t heard about any plans Border Patrol had to build a gate in that gap, either. But it’s deeper than a disregard for laws, according to Nicol. Building border fencing has everything to do with politics. President Donald Trump’s administration’s plans to add miles of more border fencing in Hidalgo County and to fill in gaps in the fencing in Cameron County is no surprise. Trump boldly declared in his 2015 presidential run announcement that he would build more border fencing. “I would build a great wall, and nobody builds walls better than me, believe me, and I’ll build them very inexpensively, I will build a great, great wall on our southern border. And I will have Mexico pay for that wall,” Trump said. House Speaker Paul Ryan recently said during a National Press Club appearance that followed the appointment of Supreme Court Justice Brett Kavanaugh that the next big fight in Washington, D.C., was likely to be a showdown over Trump’s border plans. “We intend on having a full-fledged discussion about how to complete this mission of securing our border and we will have a big fight about it,” Ryan said, according to multiple news outlets that reported on the appearance. The assertion that the government needs to secure the southern border was also echoed in the documents Nielsen filed with the federal register. “For example, in fiscal year 2017 alone, Border Patrol apprehended over 137,000 illegal aliens. In that same year Border Patrol seized approximately 260,000 pounds of marijuana and approximately 1,200 pounds of cocaine,” Nielsen said in the document. It should be noted that cocaine is typically smuggled through ports of entry, not across the Rio Grande — a fact known to the government that it acknowledges in the Drug Enforcement Administration’s annual National Drug Threat Assessment reports. Marijuana smuggling is far more common. The areas where DHS wants to fill in border fencing gaps in Cameron County are often described as known smuggling corridors in federal criminal complaints. Those complaints include examples of hundred-plus pound seizures of marijuana, high-speed chases and vehicles loaded with marijuana wrecking in farm fields in the Southmost area, as well as in rural areas DHS is targeting south of Rancho Viejo and San Benito. Illegal entry arrests are also common in these areas. Manuel Padilla, Border Patrol chief of the Rio Grande Valley Sector, told the Texas Tribune earlier this year that he believes that barriers erected in historic areas for illegal drug smuggling and illegal entry like San Diego and El Paso have dramatically decreased instances of illicit activity in those areas. Nicol, the co-chair of the Sierra Club Borderlands Campaign, doesn’t buy the argument that border fencing will stop the flow of drugs into the United States. The political rhetoric that suggests the border is insecure is also disingenuous, according to Cameron County Judge Eddie Treviño Jr.
“You talk about fake news, that’s fake news,” Treviño said. Texas Department of Public Safety reports indicate just how secure the border is. Aside from miles of fencing in the Rio Grande Valley Sector, as of Jan. 1, 2018, there were 5,000 surveillance cameras in the region. There are 13 vessels deployed on the Rio Grande to deter and detect smuggling activity. Twelve aircraft patrol the Rio Grande Valley that receive direct alerts from ground sensors and surveillance cameras. Six aerostats operate in the Valley that are equipped with cameras that can see for up to ten miles. There are also thousands of personnel, from Border Patrol agents to U.S. Customs and Border Protection Officers to DPS troopers to local law enforcement agencies that routinely work together to stop smugglers. Governor Greg Abbott even called in the Texas National Guard to support border operations. Treviño, like Nicol’s, believes that the border is just being used as a political football to drum up support with voters who believe the border needs to be secured. “We wish that our leaders in Washington and this administration would just pay a little more attention or heed our information that the reality on the ground, as opposed to what sits within the political picture that they’ve been wanting to paint for the last ten years, that is just in no shape or form accurate whatsoever,” Treviño said. Michelle Serrano, communications strategist with the Rio Grande Valley Equal Voice Network, said border communities have astoundingly low rates of crime, contradicting a larger national narrative that the border is under attack. “If we really want to consider general safety, then we should seriously listen to concerns that construction of such structures have a negative impact on our flood plains and that walls could cause severe and unnecessary flooding into neighboring communities,” Serrano said. She also questioned why the federal government should continue to spend billions of dollars on a border fence and whether it truly will make the United States better off.